So you’re blazing your way up the Trailhead ranks, from Hiker to Adventurer and beyond, and you want your LinkedIn connections, recruiters, and Mr. Benioff himself to know that you’re actively learning! 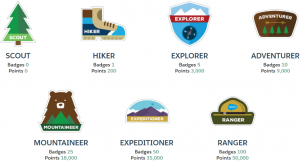 Whether you’re brand new to Salesforce or have a certification (or multiple) already, publicizing your Trailhead activity will make you more visible to recruiters and let your network know you’re keeping your skills sharp. Back to your LinkedIn account, in the Education section of your profile, ‘Trailhead by Salesforce’ is a recognized School! You can include the year you started, a description of specific Trails or Modules, your profile link from above, and whatever else you want to describe about your learning goals. When recruiters search, filtering by School is one of the options, so this is a nifty way to make sure your Trailhead activity shows up when someone includes that in their search. 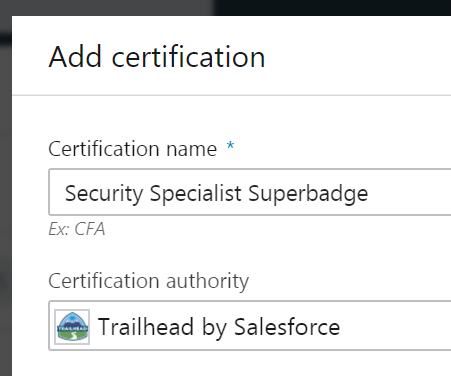 In the Certifications section (under Accomplishments), you can list out individual Badges or Superbadges you’ve completed, for example the Security Specialist Superbadge, and include your Trailhead profile link as the ‘Certification URL’ for proof. This is also the perfect place to display your Salesforce Certifications once you’ve passed your exams! 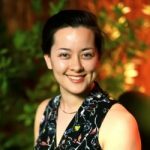 Please do drop a comment if you’ve found this useful, and reach out to me with any questions; as a training partner of Salesforce, I’m immersed in the Salesforce education world and happy to give tips/point you to resources that fit your timing and budget. Happy trailblazing and happy 2018! Lauren Todt, Recruiter based at K2 Partnering Solutions in San Francisco.